Are you planning to start your hair salon and discovering various ways to gather more customers to know you and come to your salon? If this is the case, then you are in the right place. An online presence plays a very important role in making your beauty salon successful. It gets you a new and trustworthy customer base. For showcasing your skills online, the best thing you can do is to create a professional WordPress hair salon website. A salon, spa or a beauty website should be attractive and inviting. This can only be done with the help of a WordPress theme that is perfectly suited for your niche. 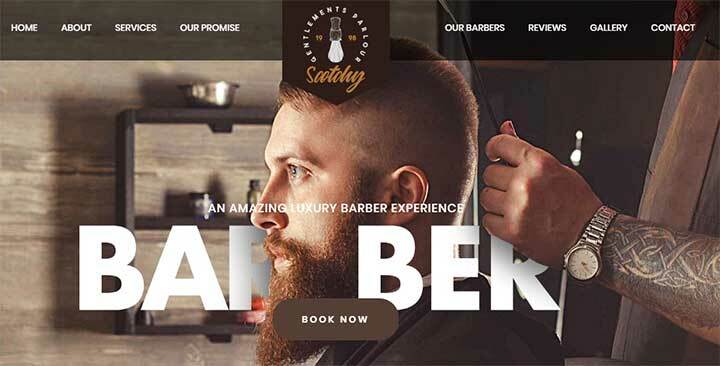 Today, we will tell you about some best hair salon WordPress themes that will help you kickstart your business in a stunning way. If you are looking for high performance and versatile WordPress theme for hair salon, then TheGem is for you. 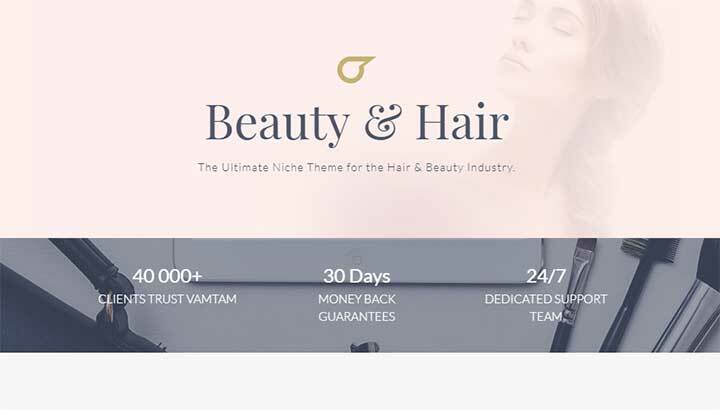 The core feature of this theme is that if you want to sell the products of your hair salon, then this theme is WooCommerce ready. It has forty multi-purpose designs with 150 unique demo pages. The possibility to grow your business with this theme is unlimited. TheGem theme is built by unique designers to give an attractive look to your hair salon website. The other features of this theme are 2500+ customizable icons, flexible header and footer, unlimited color options and easy to use admin panel. You will also get the one-page fullscreen slider with the mega menu in two different and unique styles. Fancy heading page option with showcase your business title more effectively. The unique feature of this theme is that it comes with future proof design. An elegant multipurpose theme, Bridge offers more than 300 demos which you can use to create fully responsive websites of any niche. It also provides you with 24 layout concepts, featured area, subscribe widgets, social media icons and many different features. This hair salon website theme also provides functionalities such as Full Listing Functionality, Full news functionality, full restaurant functionality, and Front-End Login Functionality. Other out of the box features of this theme include Fully customizable title area, headers, mega menu, sticky headers and more. Another largest selling theme BeTheme is a WordPress multipurpose theme. It has a lot of features when it comes to creating a niche-specific website such as a salon website. It offers 400+ pre-built demos which you can easily import with just one click. Furthermore, it also offers its own Muffin Builder 3 which can be easily used to customize the website incredibly. BeTheme comes with 20 header styles, 200+ shortcodes, parallax effect and unlimited menus. It also offers three different blog layouts, four different portfolio layouts, mega menu options, unlimited menus and a lot more. One of the most powerful and flexible themes, ultra is a multipurpose beauty theme that allows you to create an amazing and responsive website with full flexibility. This theme comes with a variety of predefined skin and pre-made demo sites. You can import any demo with just one click thus saving your time and effort. Other useful features that this theme offers include 12 Bonus Builder Add-ons, 60+ Pre-designed Layouts, 17 header styles, five single post layouts, six header background options and many more. You will also get options like section scrolling, mega menu, archive layouts to make a fully-functional website. One of the modern multipurpose themes, Composer allows you to create a variety of niche-specific websites. This theme comes with 200+ layouts and 90+ demos. So you can choose the best one for your salon business website. Moreover, composer offers you Visual Composer Page Builder that you can use to customize these demos as you want. You will also get amazing header options to choose from. Other useful features, this theme offers include WooCommerce compatibility, portfolio layouts, a variety of premium plugins included, unlimited header layouts and a lot more. A dedicated spa, hair and beauty salon theme, Kendall is all you need to create a gorgeous hair salon website. This theme offers a beautiful collection of spa, hair and beauty salon layouts to help you get started with utmost ease. You can also customize these designs with the help of WPBakery Page Builder that is included in the theme. It is a fully-flexible theme which offers a vast collection of Goodge web fonts and typography option. Furthermore, this theme is also WooCommerce ready. Therefore, if you wish to start a completely dedicated and elegant hair salon website and do not wish to indulge yourself in the coding aspect, Kendall can be the perfect option for you. 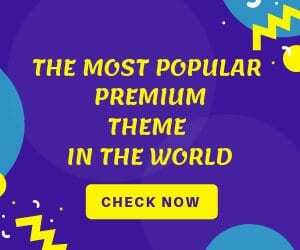 Oshine is one of the best selling multipurpose creative themes which allows you to create sites for any purpose with much ease and flexibility. From a portfolio, photography, model agency website to a beauty and wellness website, you can create anything with this creative theme. 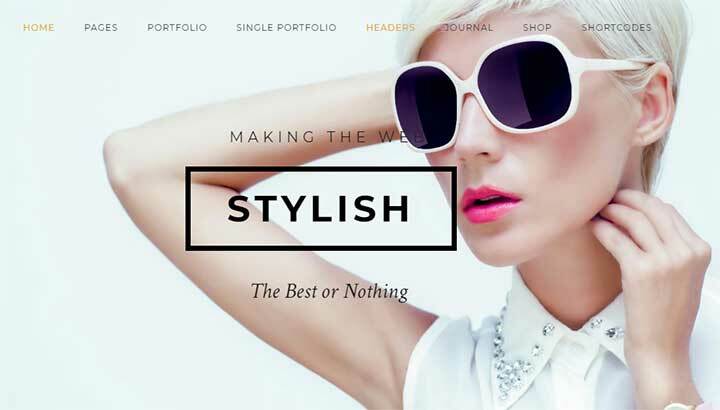 It offers 50+ styling modules to help you customize your site in the most beautiful way. You can also choose from a variety of stunning portfolio layouts this theme offers and create a hair salon website of your dreams. Moreover, Oshine offers multiple headers and menu styles, six blog styles, 20+ project page styles, and many more options to customize the look and feel of your website. It is a stunning theme that allows you to have complete control over fonts and colours and is also compatible with various popular plugins. 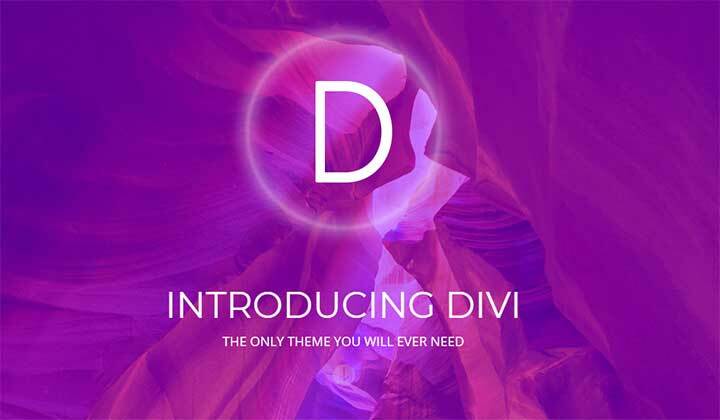 Divi by Elegant Themes is one of the topmost multipurpose WordPress themes. The best part about this theme is it comes with its own fast and intuitive front-end Divi page builder. You can use this page builder to customize the theme for your niche-specific website. Divi also offers 20+ pre-built layouts to choose from. So, you can easily create and save your own Divi layouts and use them later. Divi theme also supports different types of formats in the form of tables, video sliders, videos and much more. Kallyas is a top selling and popular multipurpose theme which you can create a beauty salon website of your own. This hair salon WordPress theme comes with more than 65 demos dedicated to almost every profession. 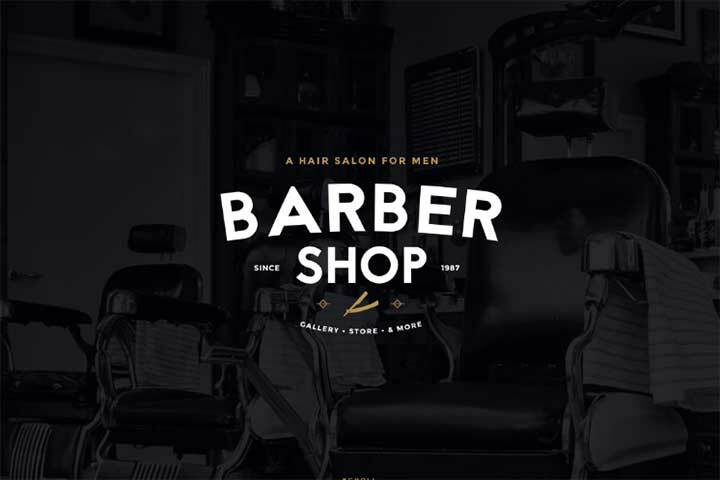 Its Barber Shop demo is perfect for creating a salon website. Moreover, with some amazing customization options, you can easily customize these demos to create the perfect layout for your business. Kallyas gives you a visual builder with drag and drops support. You will also get more than 100 elements to make the layout richer. Kallyas is a fully-fledged with a variety of amazing useful features. These include unlimited sub headers, unlimited colour options, WooCommerce integration, the inclusion of premium plugins, multiple blog layouts and a lot more. The Hairdo is the most flexible and versatile hair salon WordPress theme for your beauty salons and barbershops. The best thing about this theme is that it can be used for any type of business. The Pre-design page can be used for creating a different style of home pages. You will get easy to use admin panel by which you can easily make changes and updates to your website. You will also get wide and boxed pages option by which you can easily customize your background. The advance blog post option gives you different style layout to post your blogs. By using the multi-post option, you can post a group of articles by which a user can easily browse from them. Even if you don’t have any knowledge of coding and website development then also you can manage your website by using Hairdo WordPress theme. A salon is a contemporary, unique and attractive hair salon WordPress theme for your Barbershop or Tattoo shop. It comes with impressive vintage and authentic design. If you deal with laser technique for tattoo removal, shaving, piercing, spa, groom, and haircut, then this theme is definitely for you. The unique feature of this theme is you will get online booking and management section, WooCommerece ready, different layouts dark and light, and event management section. In this theme, you will get a manageable layout by Essential Grid and WPBakery. The core features of this theme are it is ultra responsive; you will get lifetime updates and eye-catching display. Another amazing hair salon niche theme, Hair Salon has been made to create any type of website in the hair and beauty industry. From hairdressing, pedicure, manicure, makeup to spa and body treatments, you can create any type of website with this theme. With incredible homepage and header options, this theme offers a variety of options to choose from. Moreover, this theme also offers unlimited colour styles with four predefined skins in the theme of skin switcher options. Hair Salon WordPress theme also provides you with endless layout possibilities with 20+ layouts for header and footer, sticky headers, and much more. This theme is also translation ready, and you will get Ninja Forms, MailChimp, Icon Font Manager, Slider revolution and many more premium plugins free with the theme package. All in all this theme offers a variety of useful features which you can use to create a website of your dream. A modern and attractive multipurpose WordPress theme, LeadEngine offers you all the features which you require to create a flexible yet stunning salon website. This hair salon WordPress theme comes with an array of 200+ template blocks and 35+ pre-built websites to choose from. You can choose their Beauty Salon demo and get started with your salon website quickly. It also offers the WPBakery Page Builder that gives you fast and hassle-free customization options so that you can customize your site with least time and effort. This theme also includes premium plugins like WPBakery Page Builder, Slider Revolution, and IconsMindPack to help you customize your site in the best manner. One of the top selling themes of all time, Avada is a multipurpose theme with power and flexibility. This theme comes with a variety of options to help you add almost any type of element to your website without the need of any coding knowledge. It offers various demo pages and pre-loaded setups with one-click installation. Avada comes with a lightweight and powerful drag and drop page builder called Fusion builder that you can use to customize your website with ease. It also supports bbPress and WooCommerce and comes loaded with many premium plugins. Entrepreneur is a powerful WordPress theme designed especially for professions like hair stylists such as salon, spa, barber shop, beauty shop and more. This themes largely helps in converting your visitors to customers with the help of built-in conversion forms, booking and scheduling calendars. Moreover, this barber shop theme offers unique portfolio layouts and form templates for easy and quick setup. You will also get 1000+ icon font pack to customize your site. Entrepreneur provides 7 One Page Demos, one multi-page demo, full WooCommerce support, Unlimited sidebars and widget areas and many other useful features. Coiffeur is a fascinating hair salon WordPress theme which is fit for hair salon, hairdresser and beauty salons. This theme is elegantly designed to meet the requirements of the massage parlor, day spas, beauty centers, medical business, and hair salons. This theme comes with great features and flexibility because of which you can easily customize it according to your hair salon. 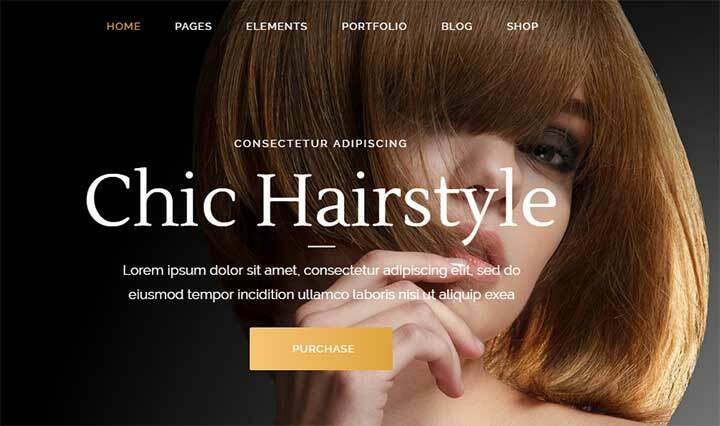 Coiffeur WordPress theme has everything which you need for your hair salons like incredible homepage, beautiful sliders, and background slideshows. You will also get other features such as 20+ templates, online booking form, different sliders, the smart gallery for beautiful blogs, 300 icon types for your salon, social media integration, and custom widgets. If you have just started your hair salon, then this theme is best to grow your business. If you want to grow your beauty business in the small sector, then Cinderella hair salon WordPress theme is only for you. With the flexible visual composer, you can create and edit your hair salon website anytime. You will get four different color scheme, nice header layouts, listing layouts, booking option, 800+ google fonts, regular updates, and one-click import option. Cinderella WordPress theme is fully responsive and retina ready which will give crystal clear look of a website on any device. By using Cinderella theme, you can save a huge amount on the visual composer. An elegant wellness, beauty, and lifestyle theme, Aviana offers all the features that you require to create a hair salon or wellness website. 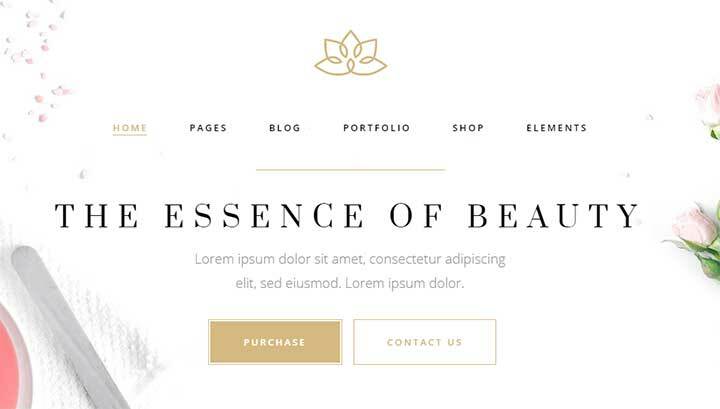 This theme offers elegant demos powered by a page builder which allows you to easily create custom templates with easy drag and drop options. Moreover, Aviana also offers a variety of shortcodes which you can easily use to customize any of your post or page. These shortcodes can add different interesting elements to your websites such as sliders, tables, CTA buttons and much more. Aviana is also compatible with WooCommerce so you can easily sell your products and services online. It offers a variety of customization and typography options that can make your wellness website stand apart. 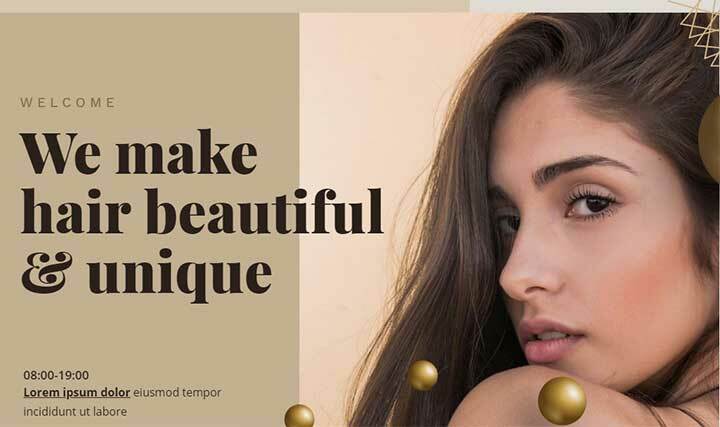 Another niche specific theme, parlour is a modern and creative theme that offers you amazing predefined designs to start with your beauty salon website in just minutes. This theme has been created carefully keeping in mind the complex work routine of a beauty salon. Moreover, it has been optimized for the very fast and mobile-friendly experience. Parlour is powered with the Elementor Page Builder that offers flexible and user-friendly custom elements to help you design a stunning website. Moreover, you will also get ten unique homepage demos, a beautiful template library, ten header and five menu styles. This hair salon WordPress theme uses a popular booking system called Booked with some great booking features. 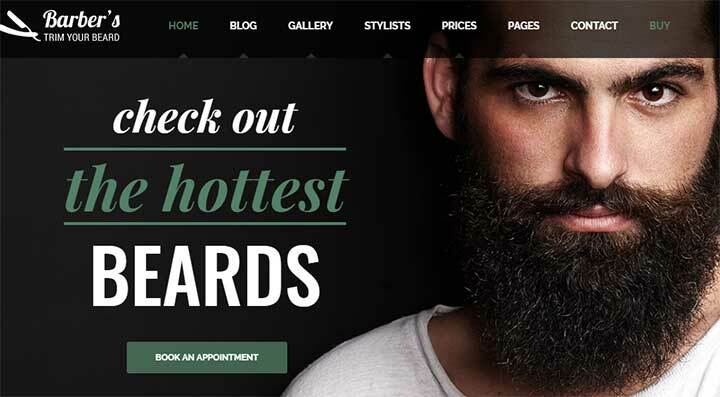 If you need a completely dedicated website for Barbers and hairdressers, you can choose this theme. Barber is a modern and sophisticated theme which can easily be used to setup your business without any coding knowledge. It offers unlimited color options with a color picker to simply select your favourite one. Other attractive feature of this theme includes a fully functioning booking system from a premium plugin called EZ Schedule Manager. 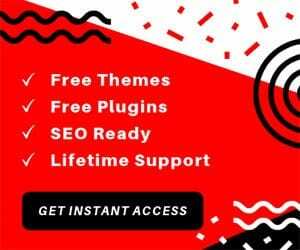 You will also get 100s of shortcodes, multiple portfolios and blog page variations, multiple header variations, unlimited home page template and five post template included in the theme. You is another amazing premium and fully-responsive multipurpose WordPress theme best suited for websites of any type of profession. You is a unique theme which comes with 3D single pages, pre-built page layouts, unlimited headers and much more. 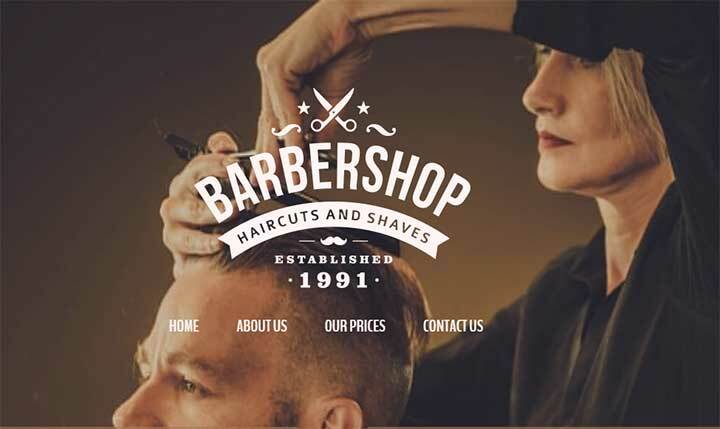 This barber shop theme also offers a new concept called Flexishapes which bents, slants or curves your content and make it look stunning. Moreover, this theme is also compatible with plugins like WooCommerce, bbPress, and Contact Form 7. Curly is a niche specific theme for hairdressers and hair salons. This theme is packed with a huge collection of layouts to help you set up a stunning website. Curly is highly customizable and offers an extensive admin interface with six homepage examples and a lot more. Moreover, you will also get the Slider Revolution and Visual Composer Page Builder plugin for WordPress. Curly also offers a list of shortcodes to get started easily with all the functionalities of a salon website. 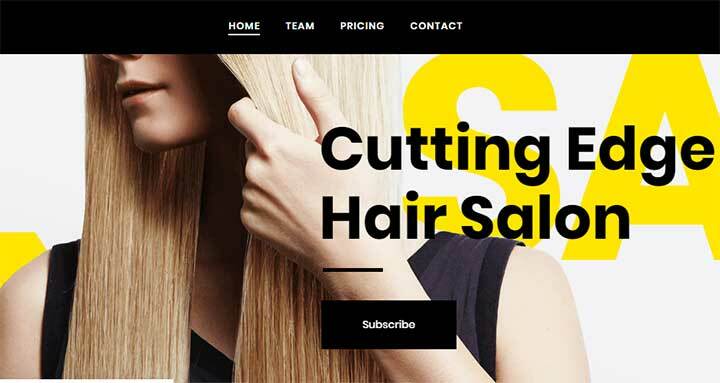 Other useful features of this hair salon WordPress theme is that it can be extremely useful for your hair salon websites are Parallax sections, Mega menu, Working hours widget, Download shop cart widget, Powerful typography options, 800+ Google Fonts and many more. A handcrafted beauty salon WordPress theme, Spa Lab is best suited for hair salons, wellness centre and other types of lifestyle websites. The powerful theme options offered in this theme allows you to brand your website. Spa Labs also offers Reservation Facility, Catalog Page Options, Gift Card options, mega menu, therapists page and multiple types of gallery posts. It also offers unlimited layout possibilities to customize your website and RTL support as well. You will also receive seven new header types, shop page types, a variety of shortcodes and the awesome Visual Composer Page builder to design your website with ease. A clean WordPress theme, Newspaper allows you to create a niche specific website with ease. This hair salon blog theme is fast and easy to use for websites such as fashion, beauty, wellness, food, travel, luxury and more. Moreover, this theme is integrated with platforms like Instagram, bbPress Forum, BuddyPress and WooCommerce. Newspaper will offer you 420+ ready to use demos for your website. It applies all SEO practices and loads only the critical content and eliminates the unnecessary ones. So, if you wish to create a fast loading, SEO friendly and modern website, this theme can be the right option for you. Any Other Beauty Salon WordPress Theme? We hope you liked our collection of best WordPress Hair Salon Themes. Do not forget to tell us which one was your favourite and why. If you think there is a better option that we missed out, do let us know. We would love to add them to our list.